There has ever been speculation about William Shakespeare. Did he exist? Was he a single playwright or several over a period of time? Or was he someone else altogether? Anonymous tells one version of this story; in this case, that it was the Earl of Oxford (Rhys Irfans), a member of nobility who could not participate in the low arts due to his high status. And there are all other kinds of suggestions about children born out-of-wedlock to Queen Elizabeth (Vanessa Redgrave and, when younger, her daughter, Joely Richardson) and other scandals. I have no idea about whether any of the information presented was at all factual and, quite honestly, I don’t care. It’s a great yarn, true or not. It’s got all of the sleazy backstabbing and nastiness that a good tale should have – and it’s funny through all the drama. Oh, and the costumes. Oh my. 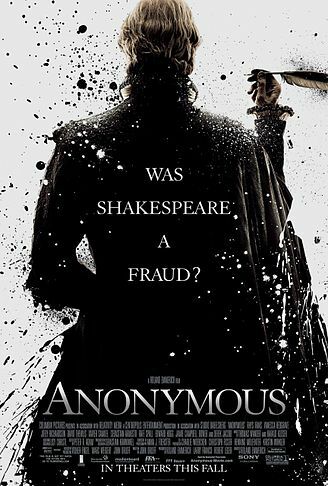 Anonymous was nominated for an Oscar for Best Achievement in Costume Design.